Accessory designer Twelve South always steps up to the plate when there’s an Apple-related problem to be solved. In the case of the new CaddySack ($49.99), the problem solved is what to do with all of those cables and adapters that are a necessity with the USB-C MacBook and MacBook Pro. As part of the iconic BookBook family, the CaddySack looks like a leather-bound book. The leather exterior is a deep chocolate color, embossed on the spine with decorative touches and gold-leaf (probably faux…) highlights. 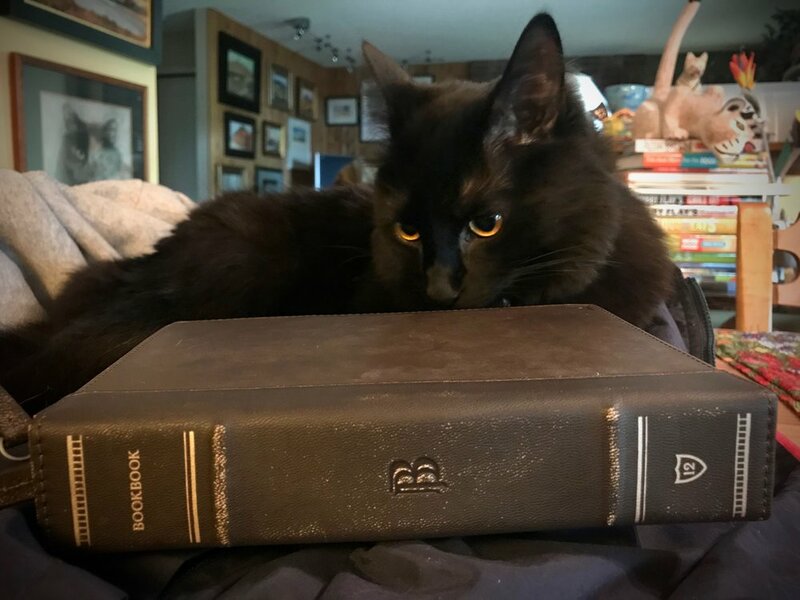 Like the other BookBook accessories, the CaddySack is classy and well-made. Open the zipper that closes the case with the leather zipper pull, and the interior is just as nice. 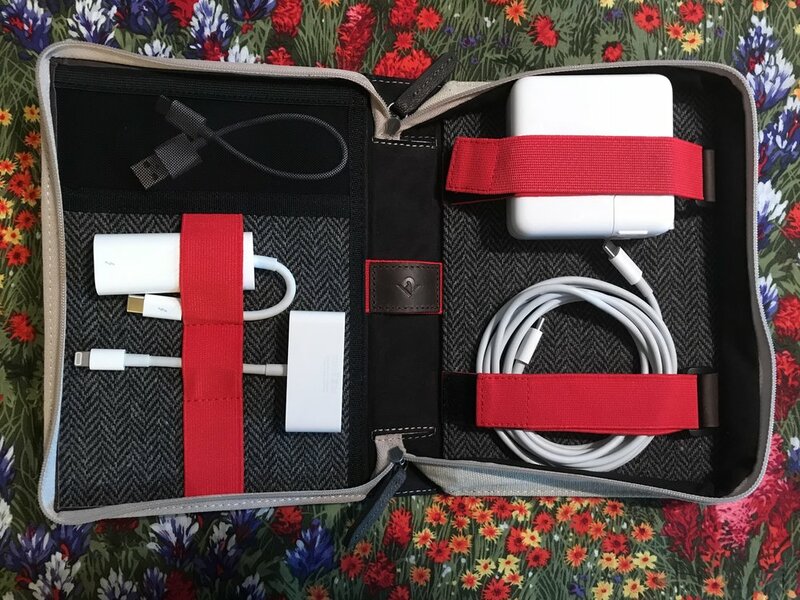 A black and gray herringbone material lines the interior, while bright red elastic bands expand to keep everything tightly in place during transit. There’s a small stretchy pocket on one side for those small bits that are easy to lose. The CaddySack weighs just 7.7 ounces (218.29 grams), so it won’t weigh down your computer bag. 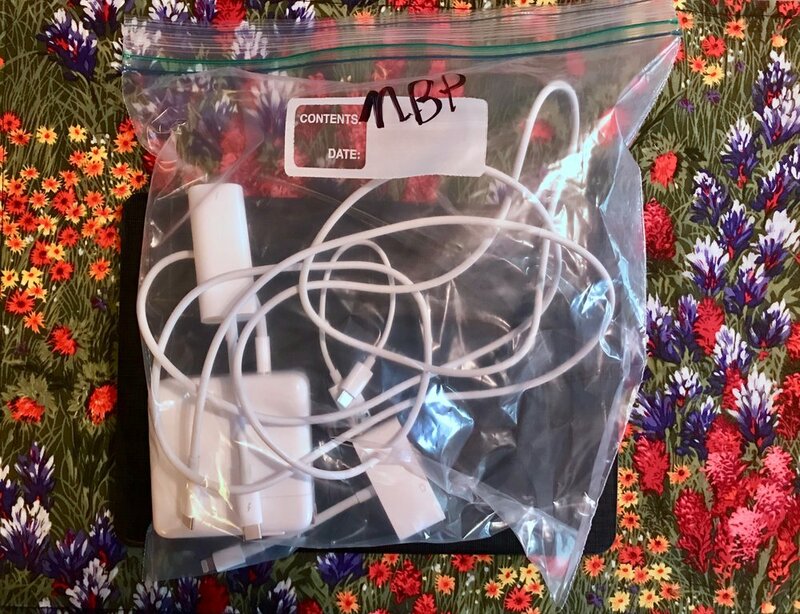 I am embarrassed to say that I used a standard plastic gallon plastic bag to round up my dongles and cables in the past (see images above). With the CaddySack, everything is a lot more tidy than in the past. It also looks pretty darned nice, especially with a furry beast (Pippin) behind it. It might cost a bit more than a plastic bag, but the CaddySack certainly looks a heck of a lot better and has more organizational tools than the bag.